Even before self-driving vehicles hit the market in any kind of mass numbers somewhere down the road, researchers are already looking at the next potential mode of travel: in the air. The idea is that consumers would request an on-demand aerial taxi, somewhat like ridesharing services today, except the vehicle would hold up to six passengers and fly with a range of up to 200 miles. A new study takes a look at what some of the public thinks about the idea of flying around in air taxis or drones, and it appears there’s some support along with concerns. There are differences by geography in support for the flying vehicles, according to a study conducted by Airbus UTM, a division of the Airbus Urban Air Mobility Unit. A total of 1,500 adults were surveyed in Los Angeles, Mexico City, New Zealand and Switzerland. The goal was to select areas representing regions of urban and rural, high and low income, developed and developing markets, according to the researchers. In Mexico City, 67% of consumers are likely to use an urban air mobility system, compared to 46% in Los Angeles, 32% in Switzerland and 27% in New Zealand. The top concerns are safety (56%), type of sound generated from the aircraft (49%), volume of sound from the aircraft (49%), time of day at which aircraft are flown (48%), altitude at which the aircraft fly (48%) and the landing spots of the aircraft (41%). 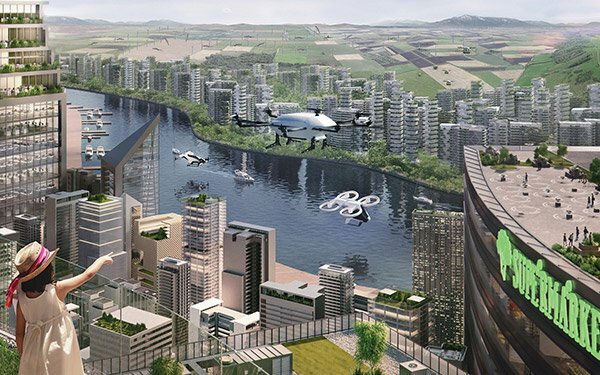 Overall, 45% support the idea of flying vehicles and 41% see urban air mobility as safe. The idea of self-driving cars is so yesterday.